Master storyteller, Doug Stevenson, presents step-by-step instructions, revealing how a story is crafted and presented. He tells stories and analyzes them so you can see how it is done. The Story Theater six-pack audio learning system takes you from choosing your stories, crafting the message, through to presenting them in public. Nothing is left out. This is the most comprehensive and detailed analysis of the art of business storytelling ever. If you like specifics, you’ll love the way Doug teaches. He breaks it all down into bite-sized chunks so you can understand and implement each specific principle immediately. This comprehensive and practical exploration of storytelling in business will help you to be a better speaker immediately. 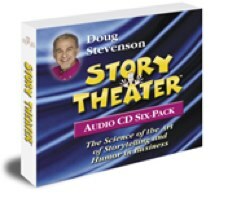 This 6 audio CD set (also available on mp3 download) covers how and why stories work, how to choose, place and develop your stories to make your business and training points; how to craft and structure stories for greater effectiveness; how to add humor and drama to your stories; and how to perform stories. Do you want to be funnier? You’ll learn the secrets of comedy and humor. Do you get nervous? You’ll learn what professionals do to combat the jitters and perform with confidence. This program contains over five hours of detail-rich content, including examples. Very comprehensive – A Coach in a Box.